John Fredrik Reinfeldt (pronounced [ˈfreːdrɪk ˈrajn.ˈfɛlt]; born 4 August 1965) is a Swedish economist, lecturer and former politician who was Prime Minister of Sweden from 2006 to 2014 and was also the chairman of the liberal conservative Moderate Party from 2003 to 2015. He was the last rotating President of the European Council in 2009. He is the longest-serving non-Social Democratic Prime Minister since Erik Gustaf Boström's first spell in office between 1891 and 1900. After his defeat in the 2014 election Reinfeldt announced that he would step down from leading the party, which he did on 10 January 2015. 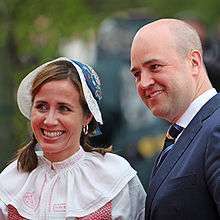 In 1965, Fredrik Reinfeldt was born in Allmänna BB hospital in Stockholm and was the oldest of three brothers to his parents Bruno and Birgitta Reinfeldt. At the time of his birth his parents lived in an apartment in Österhaninge, in the south of Stockholm County, but a short time afterwards the family moved to London, where his father worked as a consultant for Shell. Upon returning to Sweden, the family first lived in an apartment in Handen before moving to a terraced house in Bromsten in northwestern Stockholm. The Reinfeldt family was living in Bromsten when Fredrik's younger brothers, Magnus and Henrik, were born in 1969 and 1973. In 1976 the family moved into a single-family home in Täby in northeastern Stockholm County. His mother Birgitta was a leadership and management consultant, and some of her professional skills might have inspired and impressed the young Fredrik. 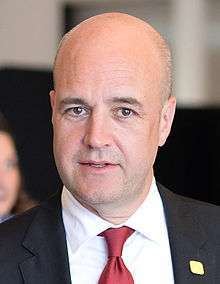 Reinfeldt became the Prime Minister of Sweden on 6 October 2006, serving concurrently as Leader of the Moderate Party. The 41-year old Reinfeldt became the youngest person to become Prime Minister since Rickard Sandler became Prime Minister at the age of 40 in 1925. With victories in 2006 and in 2010, Reinfeldt was the Moderate Party's longest-serving prime minister and the only person to lead the party to two consecutive general election victories. His Government compromised four parties (including his own) which prior to the election had formed an coalition named Alliance for Sweden, later turned into the Alliance. Reinfeldt had during his second term, in contrast to his first term, no major international engagement. Contacts with other politicians, however, remained good, which was also marked by Barack Obama's visit to Stockholm in September in 2013. On 23 February 2015, Reinfeldt confirmed that he was now in a relationship with Roberta Alenius. Alenius served as Head of Communications (Chief of the Press Secretaries) at the Cabinet Office from 2006 to 2014, while Reinfeldt served as Prime Minister. During the 2006 election, it was brought to attention that Reinfeldt's paternal great-great-grandfather was an African American circus director from New York, John Hood, who had a son with Emma Dorotea Reinfeld, a maid from Eckau in present-day Latvia. Emma Dorotea Reinfeld later married the Swede Anders Karlsson, but her illegitimate son John kept his mother's surname. The spelling was later changed to Reinfeldt. He also has Italian ancestry, via his paternal grandmother. 1 2 3 4 5 6 7 8 9 10 Ovander, Petter (18 September 2006). "Så nådde han toppen" [How he reached the top]. Aftonbladet (in Swedish). Retrieved 4 July 2009. 1 2 3 4 5 6 7 Kellberg, Christina (18 September 2006). "Berättelsen om Fredrik Reinfeldt" [The story of Fredrik Reinfeldt]. Dagens Nyheter (in Swedish). Retrieved 4 July 2009. ↑ "Frederick was a bit of class clown". Nyheter24. Retrieved 25 August 2016. 1 2 3 Triches, Robert; Marmorstein, Elisabeth (5 October 2006). "Nu är det Fredrik som styr Sverige" [Now it's Fredrik who controls Sweden]. Aftonbladet (in Swedish). Retrieved 4 July 2009. ↑ "Moderata ungdomsförbundet". Nationalencyklopedin (in Swedish). Retrieved 3 November 2009. 1 2 3 Bagge, Peter (11 September 2006). "Vägen mot toppen kantad av bråk" [The road to the top lined with fights]. Uppdrag granskning (in Swedish). Sveriges Television. Archived from the original on 6 March 2007. ↑ Berglund, Thomas (25 November 2006). "Utmanare blev ny ordförande i MUF" [Challenger became the new chairman of the MUF]. Svenska Dagbladet (in Swedish). Retrieved 8 November 2009. ↑ "COCDYC / DEMYC Officers". Democrat Youth Community of Europe. Archived from the original on 22 December 2004. Retrieved 3 July 2009. 1 2 "Historisk statistik över valåren 1910–2006. Procentuell fördelning av giltiga valsedlar efter parti och typ av val" [Historical statistics of the election years 1910-2006. Percentage distribution of valid ballot papers by party and type of election] (in Swedish). Statistics Sweden. Retrieved 30 October 2009. 1 2 3 4 5 6 "Profile: Fredrik Reinfeldt, the Alliance's clean-up man". The Local. 13 September 2006. Archived from the original on 1 March 2009. Retrieved 4 July 2009. ↑ Savage, James (22 August 2006). "Sweden's new workers' party on the cusp of power". The Local. Archived from the original on 22 June 2007. Retrieved 4 July 2009. 1 2 3 4 5 6 7 8 9 "Profile: Fredrik Reinfeldt". BBC News. 18 September 2006. Retrieved 4 July 2009. ↑ "Moderatledaren nöjd med facket" [Moderate leader satisfied with the union]. Svenska Dagbladet (in Swedish). 23 August 2006. Retrieved 2 July 2009. 1 2 3 Bagge, Peter (11 September 2006). "Reinfeldts politiska lappkast överraskade" [Reinfeldt's political turnaround is a surprise]. Uppdrag granskning (in Swedish). Sveriges Television. Archived from the original on 2 March 2009. ↑ "Reinfeldt lanserar "nya" moderaterna" [Reinfeldt launches the "new" Moderate]. Sydsvenskan (in Swedish). 25 August 2006. Retrieved 4 July 2009. ↑ Linder, P. J. Anders (26 August 2005). "Nu ska Sverige få sin Blair" [Now Sweden will have its Blair]. Svenska Dagbladet (in Swedish). Retrieved 4 July 2009. ↑ "Detta är de nya moderaterna" [This is the new moderates]. Dagens Nyheter (in Swedish). 11 June 2005. Archived from the original on 1 October 2007. Retrieved 4 July 2009. ↑ Lyall, Sarah; Ekman, Ivar (17 September 2006). "Sweden's governing party voted out after 12 years". International Herald Tribune. Retrieved 4 July 2009. ↑ "Alliance manifesto targets jobs and environment". The Local. 23 August 2006. Archived from the original on 1 March 2009. Retrieved 4 July 2009. ↑ "Key Persson aide behind email scandal". The Local. 25 February 2006. Archived from the original on 1 March 2009. Retrieved 4 July 2009. ↑ "Social Democrats admit to Reinfeldt smear campaign". The Local. 24 February 2006. Archived from the original on 1 March 2009. Retrieved 4 July 2009. ↑ "SD staffer quits over email storm". The Local. 24 February 2006. Archived from the original on 1 March 2009. Retrieved 4 July 2009. ↑ "Reinfeldt werewolf pictures inflame smear scandal". The Local. 28 February 2006. Archived from the original on 1 March 2009. Retrieved 4 July 2009. ↑ Gunnarsson, Helena (27 February 2006). "S-ledningen spred varulvsbild på Reinfeldt" [S-management spread werewolf picture of Reinfeldt]. Dagens Nyheter (in Swedish). Archived from the original on 1 October 2007. Retrieved 4 July 2009. ↑ Nilsson, Dan (27 February 2006). "Reinfeldt har polisanmält mejlen" [Reinfeldt has filed a police report about the emails]. Svenska Dagbladet (in Swedish). Retrieved 4 July 2009. ↑ "Narrow win for Swedish opposition". BBC News. 17 September 2006. Retrieved 4 July 2009. ↑ Ewing, Adam (18 September 2006). "Democrats mourn loss of power". The Local. Retrieved 4 July 2009. ↑ Savage, James (13 November 2006). "Social Democrats 'are like a sect'". The Local. Retrieved 4 July 2009. ↑ Savage, James (19 September 2006). "Reinfeldt asked to form a government". The Local. Archived from the original on 1 March 2009. Retrieved 4 July 2009. 1 2 3 Pollard, Niklas; Sennero, Johan (25 June 2009). "Sweden, on eve of EU presidency, sounds debt alarm". The Guardian. Retrieved 1 July 2009. 1 2 Lungescu, Oana (1 July 2009). "Sweden pushes EU climate action". BBC News. Retrieved 1 July 2009. ↑ Pollard, Niklas; Sennero, Johan (25 June 2009). "Swedish PM says no to extra stimulus in budget". Reuters. Retrieved 1 July 2009. ↑ Rising, Malin (26 June 2009). "Sweden wants to resume EU talks with Turkey". Taiwan News. Retrieved 1 July 2009. ↑ Löfgren, Emma (2015-01-19). "Fredrik Reinfeldt startar eget" [Fredrik Reinfeldt opens his own business]. Dagens Nyheter (in Swedish). Retrieved 19 January 2015. ↑ Samimi, Ardalan (2015-08-25). "Fredrik Reinfeldts bok släpps på Manilla" [(Fredrik Reinfeldt launches his book] (in Swedish). Dagensopinion.se. Retrieved 25 August 2015. ↑ Karlsson, Pär (2015-12-11). "Här är Reinfeldts nya toppjobb" [This is Fredrik Reinfeldt's next admission]. Aftonbladet (in Swedish). Retrieved 11 December 2015. ↑ "Medaljförläningar" [Medal presentations] (in Swedish). Royal Court of Sweden. 2016-01-28. Retrieved 2 February 2016. ↑ Bray, Chad (15 March 2016). "Bank of America Hires Ex-Swedish Prime Minister Fredrik Reinfeldt". The New York Times. Retrieved 5 April 2016. ↑ Magnusson, Örjan (30 March 2009). "Moderaterna" [The Moderates] (in Swedish). Sveriges Television. Retrieved 8 November 2009. ↑ Lönnaeus, Olla (17 October 2008). "Reinfeldt driver inte eurofrågan". Sydsvenskan (in Swedish). Retrieved 8 November 2009. ↑ "Moderaterna sade ja till Nato" [Moderates said yes to NATO]. Dagens Nyheter (in Swedish). 24 October 2003. Retrieved 8 November 2009. ↑ Stenberg, Ewa (16 January 2006). "Moderaterna söker stöd för att avskaffa värnplikt" [The Moderates seek support for abolishing conscription]. Dagens Nyheter (in Swedish). Retrieved 8 November 2009. ↑ Svensson, Niklas (10 January 2007). "Reinfeldts hemliga bild" [Reinfeldt's secret image] (in Swedish). Politikerbloggen.se. Archived from the original on 6 November 2007. Retrieved 14 May 2007. ↑ "8 av 10 riksdagsmän vill ha bort Bush" [8 out of 10 members of parliament want to remove Bush]. Svenska Dagbladet (in Swedish). 15 April 2004. Archived from the original on 15 April 2004. Retrieved 14 May 2007. ↑ Nilsson, Owe (5 February 2008). "Regeringen oenig om USA-president" [Government disagree about the US President]. Svenska Dagbladet (in Swedish). Retrieved 4 July 2009. ↑ "Fredrik Reinfeldt besöker USA" [Fredrik Reinfeldt to visit the United States] (Press release) (in Swedish). Government Offices of Sweden. 5 May 2007. ↑ "Fredrik and Arnold talk green". The Local. 17 May 2007. Archived from the original on 1 March 2009. Retrieved 4 July 2009. ↑ "Swedish premier to talk climate change with Bush on first U.S. visit". International Herald Tribune. 10 May 2005. Retrieved 4 July 2009. ↑ "Bush holds talks with Swedish prime minister". Monsters and Critics. 15 May 2007. Retrieved 4 July 2009. ↑ Savage, James (15 May 2009). "Reinfeldt and Bush in climate talks". The Local. Retrieved 4 July 2009. ↑ "President Bush Welcomes Prime Minister Fredrik Reinfeldt of Sweden to the White House" (Press release). White House. 15 May 2007. Retrieved 2 July 2009. ↑ "Framgångsteologi för massorna" [Success theology for the masses]. Svenska Dagbladet (in Swedish). 2 April 2006. Retrieved 4 July 2009. ↑ "Wallström och Reinfeldt populärast" [Wallström and Reinfeldt the most popular]. Rapport (in Swedish). Sveriges Television. 29 December 2006. Archived from the original on 2 March 2009. Retrieved 4 July 2009. ↑ Melin, Lena (1 May 2008). "1 maj – då kan Reinfeldt fira" [May 1 - then Reinfeldt can celebrate]. Aftonbladet (in Swedish). Retrieved 4 July 2009. ↑ TT (7 March 2012). "Paret Reinfeldt separerar" [The couple Reinfeldt separates]. Dagens Eko (in Swedish). Sveriges Radio. Retrieved 2 February 2016. ↑ Julander, Oscar (11 July 2012). "Paret Reinfeldt lämnar in skilsmässoansökan" [Reinfeldts signs divorce papers]. Expressen (in Swedish). Retrieved 2 February 2016. ↑ Mattsson, Anna (20 February 2013). "Nu skiljer sig Fredrik och Filippa Reinfeldt" [Fredrik and Filippa completes their divorce]. Expressen (in Swedish). Retrieved 12 January 2014. ↑ "Bruno Reinfeldt hoppar av" [Bruno Reinfeldt backs out]. Dagens Nyheter (in Swedish). 20 February 2009. Archived from the original on 28 June 2009. Retrieved 4 July 2009. ↑ "Reinfeldts pappa dömd för rattfylla" [Reinfeldt's father sentenced for DUI]. Dagens Nyheter (in Swedish). 2 June 2009. Archived from the original on 11 October 2012. Retrieved 4 July 2009. 1 2 O'Mahony, Paul (3 October 2006). "Reinfeldt's ancestor 'dandy American ringleader'". The Local. Archived from the original on 1 March 2009. Retrieved 4 July 2009. 1 2 3 Ovander, Petter; Sjölund, Jill (29 September 2006). "Farfarsfarfar var "kannibal"" [Grandfather's grandfather was a "cannibal"]. Aftonbladet (in Swedish). Retrieved 4 July 2009. ↑ Orrenius, Niklas (19 November 2011). "Statsministerns avsky mot SD" [The Prime Minister's disgust with SD]. Sydsvenskan (in Swedish). Retrieved 2 February 2016. ↑ "Religion och politik ska hållas isär" [Religion and politics should be kept separate]. Kyrkans Tidning (in Swedish). 2009-07-01. Archived from the original on 22 December 2014. ↑ Perdahl, Elina (30 July 2013). "Fredrik Reinfeldts dystopiska bok "Det sovande folket" sätts upp på Teater Alma" [Fredrik Reinfeldt's dystopian book "The Sleeping People" will be set up at Theatre Alma] (in Swedish). Sveriges Radio. Retrieved 12 January 2014.